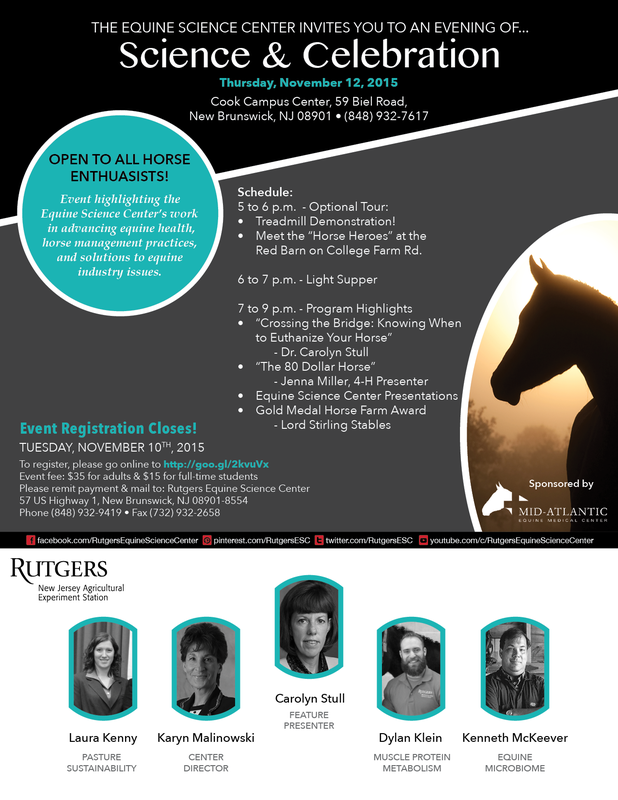 New Brunswick, N.J. – The Rutgers Equine Science Center will host its 2015 “Evening of Science & Celebration” on Thursday, November 12 from 6:00 – 9:00 pm at the Cook Campus Center in New Brunswick, NJ. The event is being sponsored by Mid-Atlantic Equine Medical Center. The Evening of Science and Celebration is an opportunity to unite equine professionals, horse owners, farm owners and barn managers, educators and students, 4-H members, and all equine enthusiasts for the purpose of learning current projects and ongoing research initiatives currently being conducted at the Equine Science Center. The Center aims to address horse industry issues and challenges through sound-science and research. This year, Carolyn Stull, Ph.D. will deliver the keynote presentation titled, “Crossing the Bridge: Knowing When to Euthanize your Horse”. Dr. Stull directs the School of Veterinary Medicine’s Animal Welfare Program at the University of California – Davis. She focuses on the well-being of agricultural animals. Also during the event, the Center will present its annual Gold Medal Horse Farm award to Lord Stirling Stables of the Somerset County Park Commission. The award, part of the New Jersey Equine Environmental Stewardship Program, gives recognition to outstanding equine farms for their dedication to environmental sustainability and management. It also underscores the efforts of the New Jersey equine industry to maintain the beauty of the Garden State. The program is a collaborative initiative by the New Jersey Agricultural Experiment Station at Rutgers University, the Rutgers Equine Science Center, and the New Jersey Department of Agriculture. Prior to the beginning of the event, the Equine Science Center will present a demonstration of the high-speed equine exercise physiology treadmill at 5:00 pm at the “Red Barn” on College Farm Road. The event requires registration that can be made online at: http://goo.gl/2kvuVx. The fee for the event, which includes dinner, is $35 for adults and $15 for full-time students.